Your dorm bedding has style and your dorm rug has style so why should your cozy foot coverings be bland and boring? Give your feet some style too with our Multi Chevron Dorm Snoozies! Our Multi Chevron Dorm Snoozie has a pink, white and gray Chevron design in varying thicknesses to give you cool style wherever you wear them! Relax in style with our super comfy Dorm Snoozies made with a brushed fleece exterior and soft Sherpa fleece interior to provide you with extreme comfort and warmth. You don't want to come back from class to relax and study in your socks or bare feet! 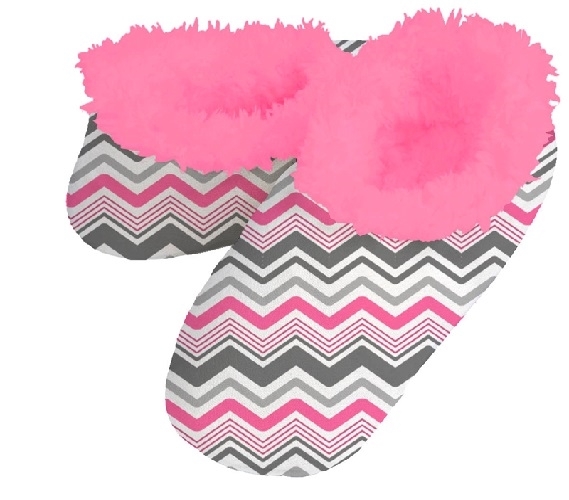 Slip on our Multi Chevron Dorm Snoozies and be comfortable right down to your toes. Your dorm room floor is going to be cold, hard linoleum or wood. If you're lucky your dorm room will have carpeting, however even your dorm room carpet is going to be thin and scratchy. You don't want to walk around on cold hard flooring all day in your dorm room! Especially when you first wake up in the morning! Make it feel more like home and stay warm by slipping on these super comfy dorm accessories! Keep your Dorm Snoozies by your dorm bed so you have them in a convenient spot when you wake up in the morning!